My 4-year-old superhero. Ellie is a big sister, little sister, niece, cousin and the world's greatest daughter. When she is not busy being a girly girl she likes doing puzzles, painting, drawing and playing teacher. Things have changed in the past few months, she does not have the same energy she used to have but boy you should see her when she is having a good day. We call her SuperEllieBelly because she is such a superhero in her own unique way. She has had her fair share of Hospital admissions dating back to April of 2016 in the PICU at Loyola's Children's Hospital. She was a strong girl through her experience then and even stronger now. January 4th, 2018 marked the first day of a new chapter for Ellie and our family. We didn't know it then, but a new journey was awaiting her. We went in for a follow up with her pediatrician at Loyola hospital because she had an accident and needed a cast on her arm on Christmas day. After that, she started experiencing recurring fevers. I was expecting the cause of her symptoms to be viral and something that would eventually subside. We met with Dr. Ramzan Shahid, who in my eyes saved my baby's life. He ordered blood work for Ellie and told us to stay and wait for results, which seemed unusual to me. Once he called us back, sat us down and spoke the words “ Ellie has abnormal blood.” My heart sank and I knew at that moment something was seriously wrong. He told me that there was a strong indication of Ellie having Leukemia. All I did at that very moment was hold Ellie on my lap and felt as the tears fell down my face. I thought it was all a big misunderstanding or a mix up of some sort. I couldn't believe what I was hearing. That same visit, we met with Dr. Eugene Suh, A Hematology - Oncologist, he reassured us that things would be okay and Ellie was in good hands & that we would go through this experience together every step of the way. Shortly after, we were admitted to Loyola's children's hospital. Although it was devastating as a parent to hear the news that your child has cancer, Ellie dealt with it much harder and with good reason. The following day she was officially diagnosed with Acute Lymphoblastic Leukemia(A.L.L). Although it still didn’t feel real It was comforting to know that the survival rate is in the 90th percentile and she will be cured. She endured a lot the first week of admission and trusted no one, but I reminded her every day we were there “I promise baby, we’re going to make you feel better.” And a few months later were on a good path with progress. This experience has been difficult, but we continue to count our blessings. Loyola Children's Hospital continues to help so many pediatric patients and families like us going through such a life-changing experience, but they're not alone in the fight. 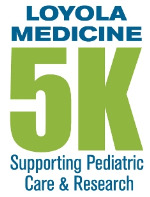 Loyola raises money every year through a 5K for pediatric programs to help benefit young patients who receive chemotherapy and care in the PICU & NICU to name a few. In June of 2016, my family participated in the Health, Hope and Heroes 5K to help support Loyola’s Mission in pediatric care and research. This not only brings families together with so many different stories, but this shows what we can do for children when we unite. My family and I felt privileged to be a part of something so special.This year is a little more personal for us. We are fundraising this year specifically to help give back and help any other little Ellie going through a such a life-changing experience and every family who receives pediatric care at Loyola.We hope to bring awareness and educate family and friends about A.L.L and join us through her journey and to never give up. We appreciate everyone who has taken the time to donate, run OR both! The support is overwhelming & worth more than words could ever express!